DC Maeve Kerrigan, DI Josh Derwent and the rest of Superintendent Godley’s team are called away from a wedding to investigate the shooting of an off-duty policeman in Richmond Park. The officer has been shot with an illegal firearm. There is no apparent motive and no substantive leads and the officers struggle to make headway in the investigation. Then there’s a second attack on several officers patrolling a sink estate, leaving a handful dead. It appears that someone is indiscriminately killing police officers. As the pressure mounts, Godley’s team struggle to make progress, though Kerrigan senses she knows what is happening and why but feels trapped to act, despite the on-going attacks. 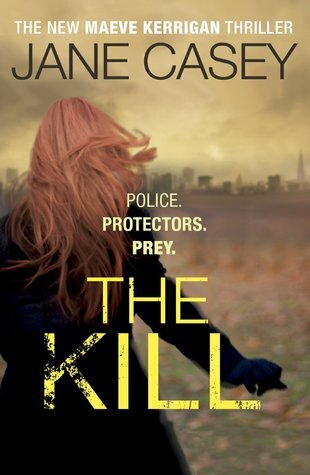 The Kill is the fifth book in the Maeve Kerrigan series. It’s a very readable police procedural, with a tense core case in which the Kerrigan, her abrasive boss, Joss Derwent, and the rest of their team investigate the murderous targeting of police officers. While the book has its moments and is generally an entertaining tale I struggled at times with the story. This was for a number of reasons, part of which is my taste in content/style. A large chunk of the book focuses on the relationship and sexual chemistry between Kerrigan and Derwent. A good proportion of the first hundred pages of The Kill were devoted to their interchanges and Kerrigan’s related internal dialogues. Personally, I found this a little tedious as much of it did not move the story forward and its consequence was to create uneven pacing throughout. I’m sure that it is this relationship, and the will they/won’t they element, that is the real appeal of the series for many readers, but for my taste it is too foregrounded. As for the story itself, I had a hard time believing in the procedural elements of the plot, where reality seemed to get sacrificed for grit and tension and the longer series arc of character relationships. Admittedly, this is common in the genre but I found I couldn’t quite fully suspend my disbelief and be swept along in the narrative as required. There is however some nice contextualisation of public perception and reaction to policing in London.